Residence in Hostels is a Privilege and Not a Right!! Since accommodation in hostels is limited, the University Authorities may not be able to provide accommodation to all applicants. Students residing within a radius of 15 kilometers of Haripur District will not be entitled for Hostel admission. The grant of admission to a program of study in the University of Haripur would not ensure allotment of Hostel Accommodation. The accommodation will be offered to the eligible applicants subject to availability. Students seeking admission to a hostel should apply through the Head of Institution/Department on the prescribed form (along with three passport size photographs duly signed by the Head of Institution/Department), which can be obtained from the office of the Provost University of Haripur. Admission in the Hostel will be strictly on merit basis. Out station students who are not residents of Haripur will be given first priority. Local students, whose parents are transferred outside Haripur, are also eligible subject to their furnishing satisfactory documentary evidence to this effect from the employer. Those students, whose hostel admission has been cancelled because of misbehavior/misconduct, violation of hostel rules, involvement in undesirable activities, and misrepresentation, shall not be eligible for hostel admission. After admission to a hostel, students shall come under the direct supervision of the Hostel Administration for the purposes of residence and its discipline. The Hostel Administration has the right to refuse admission to a student whose past conduct in the hostel was not satisfactory. A students who fails to occupy the allotted accommodation within ten days of the allotment or a student after occupying the hostel seat deliberately leaves or vacates it without the knowledge of the warden, shall forfeit his/her seat. Research Students M.Phil. / Ph.D. He must be full time student throughout the stay in hostel. Part time student shall not be entitled for hostel accommodation. If employed, must produce study leave certificate, and N.O.C from the parent organization. The allowed Tenure for M.Phil Student in hostel is two years and three Months (including 3 Months extension) from the session in the department. The allowed Tenure for Phd Student in hostel is three years and six Months (including Six Months extension) from the session in the department. Each hostel shall have a team of Monitors, appointed by the provost on the recommendation of the Wardens. Each Monitor will be In-charge of a wing in the hostel, who shall assist the Hostel Management in the maintenance of discipline and ensuring cleanliness in their wings. These should be senior students who are impartial and possess good personality. Residents shall abide by the Hostel Regulations. Violation of any regulation or order issued by the Hostel Authority shall render a resident liable to disciplinary action including expulsion from the hostel. The Warden shall deal with and process all cases of indiscipline or breach of regulations and orders relating to the hostel affairs. The Warden may impose a fine amounting to Rs. 2,000/- subject to the approval of the Provost, and the Deputy Provost/Asstt. Provost may impose a fine upto Rs. 3,000/-. Expulsion from the hostel will require the approval of the Disciplinary Committee, constituted by the University Authorities. Hostel fines shall be recorded in the Provost Office and realized through the Hostel Offices. The amount of fines shall be credited to the Hostel establishment account to be maintained by the Provost Office. Residents shall keep their rooms neat and clean. The senior Wardens will inspect the rooms periodically. Weekly inspection of the residents' rooms will be carried out by the Assistant Warden, fortnightly by the Warden, and surprise check up by the Provost/Additional Provost/Deputy Provost. On the basis of these inspections certificates shall be awarded every year to students whose rooms remain most clean and tidy throughout the year. Residents shall not be allowed for possession, custody or access to weapons, arms, and ammunition. Similarly guests/visitors with any type of arms shall not be allowed to visit a hostel. Sale, distribution or consumption of intoxicant/drugs in the Hostel/Campus shall lead to cancellation of the admission. Spreading by word of mouth or written material derogatory to Pakistan & Islam (other religions) or religious, sectarian, ethnic or linguistic hatred shall be liable to disciplinary action. Obstructing the functioning of the University or Causing disruption of peaceful atmosphere and any other activities shall not be allowed. Possession of TV, VCR/CD Player, Air Conditioner, Air Cooler, Refrigerator, Decks, Valuable, and cash money in the hostel is a breach of regulation and liable to strict disciplinary action fine/cancellation of Hostel Card. The student shall not use electric/gas heaters or related appliances in their room. In case of breach of regulations, he/she will be liable to heavy fine. Residents shall park their vehicles including motorcycles and bicycles at specified location on their own risk and responsibility. Students leaving the hostel temporarily shall inform the Warden in writing, intimating the number of days they are likely to be away. Boy students proceeding on short duration leave must be back by 9:00 p.m.
Study hours will start with the closing of the hostel gates. During study hours every student is required to study in perfect silence and avoid making disturbances. No resident shall be allowed to place any notice, placard, poster, badge/flag or any other material in writing anywhere in the hostel. No Society or Club can be formed in the hostel without the permission of the Hostel Authorities. No resident shall be allowed to take part or indulge in any sort of political activities, meetings, invitation to political figures, and other related functions in the hostel premises. Residents damaging / destroying, or removing any Hostel property shall be required to make good for the loss and shall also be liable to disciplinary action. 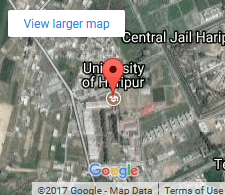 The hostel employees appointed by the University are responsible to the Warden. Any complaint against them shall be made to the Hostel Management or to a Monitor of that wing. A resident student shall not deal directly in such cases with the staff. The employees are under no obligation to attend to or work for the residents other than that assigned to them by the Warden for the service and comfort of the students. The warden or any other University Authority is not responsible for the loss of any cash and other valuable of residents in the hostel unless these are handed over to them for safe custody. Keys of the rooms allotted to the residents, shall remain in the custody of those residents and shall not be handed over to anyone without the permission of the Warden. All cases of indiscipline in the Hostels will be dealt by the Disciplinary Committee of the University of Haripur. The hostel management is authorized to lock any room in case of any violation of rules and regulations without any notice. The administration will bear no responsibilities in case of any loss or damage while dumping luggage in the store. Strict action will also be taken against any other violation or act of omission and commission. Punishment or penalty for acts of indiscipline shall be in accordance with the gravity of the case, and may any one more of the following, or any other as determined by the Discipline Committee. Withholding of Registration / Roll no. slip/examination results. Suspension of admission and ban on the entry in the premises of the University for a Specific Period. Rustication from the University for a specific period and ban on the entry into the University Campus. Expulsion from the University and ban on the entry into the University Campus. Any other penalty/punishment recommended by the Authorities. The following timings shall be observed for Hostel Gates. Hostel Mess is mandatory for all the hostel residents. Each resident student will automatically become member of the Hostel Mess and will pay for all the meals served in the Hostel Dining Hall. Each hostel shall have a Mess Committee consisting of the Warden as Chairman, the Assistant Warden as Treasurer, and four to seven representatives of the resident students recommended by the Warden and appointed by Provost for one quarter of an year. The Mess Committee shall elect from amongst its members a student as its Secretary, who shall be responsible for managing the mess under the direction of the Warden and Mess Committee. The Mess Committee will prepare a weekly menu and will prescribe quantities of food material required and suggest the source and the manner of its purchase. The Hostel staff shall maintain an up-to-date record of all the receipts and expenditure. The Warden will check the record regularly. Hostel dues and other food charges shall be disbursed with the prior approval of the Warden or' in his absence by the Provost. The Receipt books will be in the custody of the Warden. The Mess Committee will be fully responsible for the management of the hostel food arrangements. It shall prepare a monthly statement showing the amount due from each resident and shall put it on the Hostel Notice Board in the first week of each month for general information. The resident students shall clear their dues within three days of the notice, failing which a fine of Rs. 50, (Fifty) will be levied per day. If a resident student fails to clear the dues by the 15th" of the month, his / her serving of food shall be stopped and he/she will also render himself/herselfto expulsion from the hostel. Meals shall be (taken) served in the Dining Hall between the hours fixed for each meal. No meal will be served in the room of a resident student unless he or she is suffering from serious illness and has been recommended by the Medical Officer to take his or her meal in room. Residents are required to enter the Dining Hall in proper dress. Late or early meals shall be served with the prior approval of the Warden. This will be allowed only if the resident student has to attend lectures / practicals within the approved meal hours, or if he or she holds the Night Pass. Each hostel shall have a Cultural Committee comprising of three members: a Secretary and a Joint Secretary selected from amongst the resident students annually at the beginning of each session and a nominee of the warden. They shall manage the common room and organize extracurricular activities under the guidance and supervision of the warden. The common room funds shall be utilized for such activities. The hostels will remain closed during the summer vacation or whenever deemed necessary by the Authorities and all residents will have to vacate the hostels immediately. Only one hostel shall be kept opened for foreign/ M. Phil and Ph.D. students. Such students will have to pay their hostel dues in advance for the period of their stay. The University Hostels established/declared by the University shall be under the control of the Provost. The Provost shall convene meetings of the Wardens and Assistant Wardens from time to time to discuss matters concerning the affairs of the hostels and to make suitable recommendations for implementation and smooth functioning of the hostels. The Provost shall keep informed the Vice Chancellor in respect of all matters of importance relating to the affairs of the hostels, resident-students' activities. He shall obtain the approval of the Vice Chancellor for any action, which he or she proposes regarding the management of hostels. Each hostel shall be under the administrative control of a Senior Warden who shall be appointed by the Vice Chancellor on the recommendation of the Provost from amongst the senior members of the faculty. A Senior Warden shall be assisted by a Warden and an Assistant Warden. The Senior Warden shall forward to the Hostel Authorities all issues, which need immediate attention concerning the functioning of a hostel. The Warden shall consult the Senior Warden in all matters of significance concerning a hostel. He will also intimate to the Senior Warden all such information, which may have significant bearing on the hostel administration. Grant of honorarium to Senior Warden/Warden/Assistant Warden/Resident Warden shall be fixed by the University Authorities. Resident Warden will be the overall In-charge of the Hostel. He will manage the hostel affairs in accordance with the Rules and Regulations and circumstances with the Senior Warden or hostel authorities. The Resident Warden is required to stay in the hostel and will not stay out over night of hostel without the permission of the Senior Warden. Maintenance of Law & Order will be the sole Responsibility of the Resident Warden, Senior Warden and Hostel Authorities. As an In-charge of the hostel, he will use his/her discretion and judgment in all cases requiring urgent attention. He shall ensure the maintenance of discipline in and around the hostel with the help and assistance of the Senior Warden. He shall frame policies for running the hostel Mess and other facilities in consultation with Senior Warden. He shall make plans for the up-gradation of hostel facilities in consultation with the Senior Warden. The Warden has to check the resident students at least twice a month. He shall be the full time permanent employee of the University. He will be responsible for Hostel allotments in consultation with the Resident Warden. He shall manage the accounts i.e income and expenditure of the hostels under the supervision of the Resident Warden. He will look after the hostel building ensure cleanliness in and outside the hostel, repair of sanitary items, electric appliances and overall monitoring of the hostel premises, and also supervise the fortnight fatigue. He shall manage the hostel Mess/Menu under the supervision of Warden. He shall report the DSR (Daily Situation Report) about the boarders and the Hostel to the Warden. He shall report the illegal occupants of the rooms/resident(s) to the Resident Warden. He shall arrange co-curriclar activities as per directives of Resident Warden. He shall observe official timing of the University, however in special circumstances or as advised by the Warden or Hostel authority, he maybe asked to be present beyond the official timings. He will be responsible for the safety of Hostel properties for which he will maintain a Stock Register. All the Hostel employees will be dressed neatly and cleanly. Each hostel is to be provided with a Clerk, a Head Bearer, Bearers Assistant, Gardeners, Water-Carriers and Sweepers. The Clerk will be fully responsible for looking after the office and will assist the Warden in maintaining an up-to-date record of the Hostel Establishment, Stock Register, Food Register, General correspondence and Notifications etc. The Head Bearer will be fully responsible for efficient working of the staff under him/her and the safety of the hostel property. He/she will keep in his/her own charge the hostel crockery, utensils, electric equipment and other items and will report the loss, if any, to the Warden. The cook will be personally responsible for general cleanliness in the kitchen and for the safety and hygienically fit cooked food. He will not allow either outsiders or the students, except members of the Mess Committee, to visit the kitchen. He will alone be held responsible for the receipt of deficient or defective cooking substance. Faithfulness in his/her religious duties and respect for convictions of others in matters of religion, conscience and custom. Loyalty to Pakistan and refraining from doing anything which might lower its honor and prestige in any way. Respect for the elders and politeness to all: especially to women, children old people, the weak, disabled and the helpless. Respect for his/her teachers, non-teaching staff and others in authority in the institute. Cleanliness of mind, speech, habits, body and environment. Devotion to studies, sports, curricular and co-curricular activities prescribed and/or organized or carried out under the banner or the institute/University. Observance of theft and protection of personal and public property. Dedication to the protection and promotion of environment and ecosystem. Girls hostels offer accommodation to the female students of the University of Haripur subject to the availability of seats. Girls students shall go straight to their hostels after study hours from their respective Departments/Colleges. Light must be switched off after these hours. Male visitors are not allowed inside the hostel. They are requested to enquire at the Gate and get necessary information about hostel procedure. Female hostels are out of bound for males except ward boy and officers / officials of the University on duty / inspection during daytime or in an emergency with notice to visit. Residents will not be allowed to invite female guests for casual meals or for overnight stay. No outsider female should be allowed to stay in the Girls Hostel without permission of the Warden. A female guest can stay for one night only. All other outsiders private / ex-college / University students who come to stay in the Hostel during the examination session should be charged the full month room rent and light / service charge etc. they should deposit a sum of Rs.1,000/- as security and shall make full payment for the food under the Hostel Regulations. All the applications for leave and all complaints etc. or other hostel matters shall be submitted to the Warden. Students must have their applications approved and signed along with out-pass signed by the authorized official and student and the warden before going out. Sick rooms have been established in the hostels for the resident students. The Medical Officer In-charge, Female Dispenser, Haripur University and a health visitor shall visit the sick room from time to time to look after the sick residents of the hostels. For this purpose each resident would pay a sum of Rs: 500/- P.A. at the time of her admission into the hostel. This amount is to be spent for the purchase of medicine and equipment’s etc. for the sick room. Every boarder must, on admission to the hostel, submit a list of three (mohrem) visitors signed by her father / guardian along with three copies of passport size photographs of the visitors. These photos are required to be attested by the parents/guardians. Who are allowed to visit her on campus (outside the hostel) or to telephone her. Whose houses she may visit, with permission of the Warden and without pass. It must also be mentioned in the visitors list whether a resident is allowed to go for shopping alone, with the visitor, or with student and staff. Weekend night stays are allowed only once a month i.e on the last week of every month. Permission to see visitors must be obtained from Warden or senior Warden. Residents must inform their visitors about correct visiting days and timings. Male (mohrem) authorized visitors will see the visiting rooms / places. Visitors (mohrem) from outstation can visit the residents on non-visiting days with the permission of Provost only under special circumstances. University’s / Department’s function may be attended by the residents with due permission of warden after showing the necessary invitations to the Warden or Senior Warden. Permission for going out must be obtained one day in advance. While going out, the resident must sign the register giving the time of departure, place of visit and the expected time of return. She must also sign the register on her return. Night attendance of the resident’s room will be done on every Sunday morning by the Warden or Senior Warden. Residents can be fined up to Rs: 50/- to 200/- for untidiness of their rooms. Staff quarters are out of bound for hostel residents. Residents are not allowed to enter areas declared out of bound by the University. The hostel will remain closed during vacations and on Eid’s holidays. All residents shall vacate the hostel immediately at the expiry of their annual examination.